Regions in the developing world that receive tourists do not control the flow of tourists, since this flow is largely controlled by international groups based in the industrialized world. These groups do expensive campaigns on promotion, prices, deregulation and subsidies, exclusively benefiting transnational tourism corporations and for the tourists of rich countries. Foreign currency imports are weaker than expected since the initial investment requires a foreign debt and the revenues are diminished by the necessity to import goods. This ratio of escape of capital varies from 40 to 90% of currency invested in the designated zones. Tourism based on a single activity or infrastructure is fragile and dangerous since it is the object of brutal variations in demand, often unpredictable, for example the fear SARS in Asia. The right to vacations and leisure represents an inequality in consumption, of social rights and of personal development. It is even more unacceptable for disadvantaged populations in the South, and amongst them, the youth. Jobs in tourism are often poorly paid, seasonal and don’t offer possibilities for real job qualification. Workers rights are generally affected, and in the South the exploitation of women and children (including sometimes sexual) is recurrent. Tourism weakens social fabric and upsets the cultural base by reinforcing social disparity and introducing non viable consumption modes. Finally tourism, by the use of transportation that produces greenhouse gases, contributes to planetary climatic imbalance. And by its’ impact on land usage, it pollutes, destroys, overexploits, undermines and renders artificial the countryside, monopolizes real estate and creates conflicts in the use of limited resources such as water and energy. Agenda 21 Community Based Local Tourism (ALTICOBA21) is a form of answer to irresponsible and disrespectful tourism which largely exceeds this sole sector. It is a step towards the development of disadvantaged territories, with few institutional and/or economic resources, by using the structured base of activities encompassing responsible tourism. It is attached to the sustainable development area embodied in the Local Agenda 21 (the first Earth summit was held in Rio in 1992). Under the name ALTICOBA21, this initiative is fully understandable in international institutional terms (UN, European Union, World Bank…), but hard to understand for local actors unless education, follow-up, organization and proximity are provided. ‘Tourism’ Local Agenda 21s are just starting in the French speaking world (for example in Senegal and through a decentralised cooperation between the Nord-Pas-de-Calais region in France and Sainte-Anne de la Martinique). Djibouti, with ALTICOBA 21, is a pioneer country since the actions started in the year 2000. At the international level, ALTICOBA21 has been promoted at the Johannesburg 2002 Conference (RIO + 10), at the UNCTAD (Lisbon, 2004), UNESCO (Paris 2002-2004), during the first International Forum on Solidarity Tourism (IFST, Marseille-2003) and through French and Italian cooperation initiatives. A seminar for exchange and to increase awareness and promotion at the national and regional level is planned for Djibouti in January 2005 (co-financing by UNESCO is assured). In 2004, the Assamo region (Ali-Sabieh district) in the South of the Djibouti Republic, and Bankoualé-Ardo (Tadjoura district) in the North are sites of concrete work. Assamo already has 3 years of experience, while Bankoualé-Ardo is just starting. In Portugal, an ALTICOBA21 initiative by the city and intercommunal association of Evora (Alentejo) with perspectives of working in partnership with communities in Laos and Madagascar is just starting. The main objective of ALTICOBA21 is the development, if possible sustainable, of rural populations and disadvantaged territories. 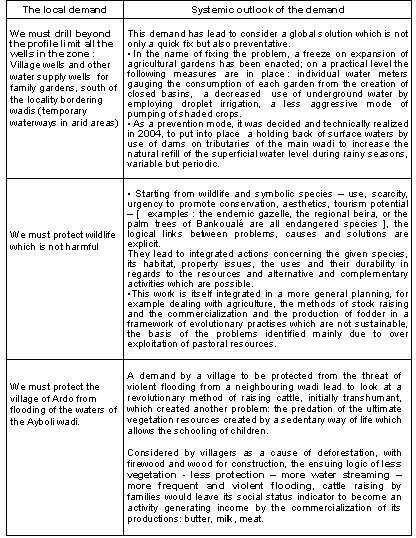 This approach contains concrete objectives for fighting social and economic poverty, the exodus of populations to cities, a logic of responding to needs, the organization of a local civil society (producers, associations, cooperatives…) in order to have a greater capacity to reduce the effects of inherent risks, unpredictable events and outside interference; these actions foster elements of participatory democracy and cooperative management of projects, educate on responsible development, a rational management (or restoration) of rare resources (species, countryside…). ALTICOBA21 is an ascending approach which has its roots in the problems and questions expressed by the community, or its representatives to deal with the causes, the solutions and the actions to be undertaken. These solutions are classified, managed hierarchically, and defined according to the fundamental principals of sustainable development. ALTICOBA21 has come together through local associations (ADDLA in Assamo), resources persons (Nicolas Prévot, Daher Obsieh, Houmed Ali Houmed…) and an international support group ( T2D2 , Tourism, Territoiries and Sustainable Developpement, with Alain Laurent, Hélène Séguéla, André Dollfus, Martine Théveniaut, Gilles Béville, Geneviève Clastres, Anne Amblès…). However, for this approach to deliver, two types of financing are needed : one to assure the follow-up and the organizational support needed and the other for the realization of the actions/ projects. ALTICOBA21 makes an intelligent representation at the periphery. That is probably how the approach is perceived. It is not equal to the tasks or stakes at hand : There may be in these initiatives a problem with the perception of the stakes and their solutions […] The possibility of tourism development in countries of the South rests for example as much on the national policies of codification and investment incentives, on infrastructure choices, on the establishment of a real capacity to promote and commercialize in these countries to counterbalance the influence of big tour operators from the North, on the training and access to technologies … than the mobilization of local actors with the help of NGOs. ALTICOBA21 is a territorial approach which is global and transversal. The actors and the analysts, all specialists and organized by sectors, have a hard time surpassing the limits of their traditional fields. Tourism, even sustainable, remains tourism. The T2D2 network, carrier of the approach actively claims, wishes and militates for some type of institutional recognition which would guarantee a seal of approval of Responsible Territory, a form of procedure assumed and demanded by coherent development of a mobilization territory around collective stakes and horizons for many decades. Considering ALTICOBA21 in the usual paradigm of always more (more clients, increased profitability, more promotion, increased businesses and commercialization…) makes no sense for it reinforces the non-viability of actual development. ALTICOBA21 is a pedagogy of better development where actors of the system intervene. And in this open vision, decompartmentatilized and systemic from the situations to be dealt, service providers of the North and South, local, national and international authorities, the businesses – sub-contractors, co-contractors, head offices - are all concerned. ALTICOBA21 is not a form of development in a bubble. That is well its interest, its strength is also its greatest handicap. In the end, who carries the voice of the territories and the societies in the integrity of their components and therefore their coherence? Where are the transversal labels? The horizontal government agencies? Who guarantees the general interest? Ultimately, who supports the attempts to record into fact the great conciliations of responsible development : short-term vs long-term, local vs global, individual vs collective, mono vs poly, simplicity vs complexity?